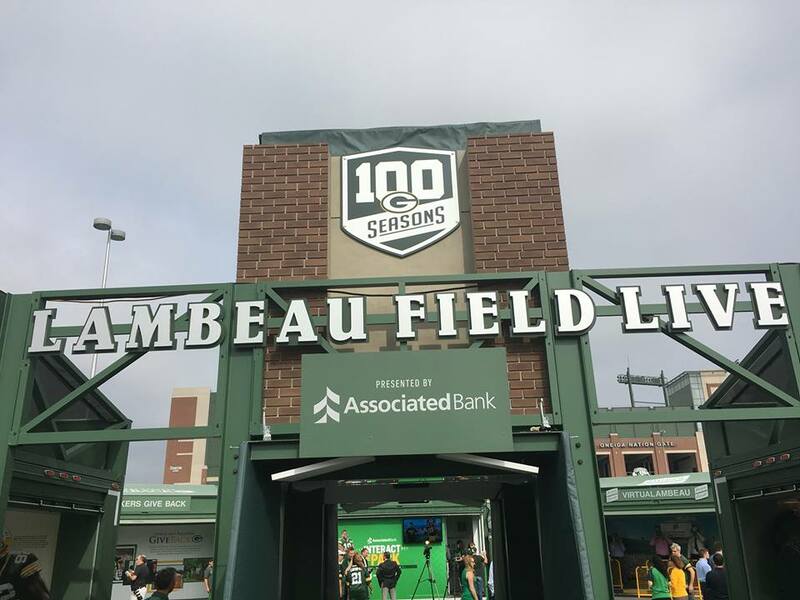 As part of the Green Bay Packers’ 100 Seasons celebration, the traveling exhibit Lambeau Field Live, presented by Associated Bank, taking the Packers on the road, kicked off its statewide tour with a ribbon-cutting and preview event this morning at Lambeau Field. The exhibit was hosted in Lambeau Field’s southeast parking lot, across from the Johnsonville Tailgate Village. The Packers TundraLine helped introduce the event with a performance. Summerfest in Milwaukee from June 27 to July 1 and July 3 to July 8; featured alumni Andre Rison on June 27-29, LeRoy Butler on June 30-July 1 and July 3-4, and Doug Evans on July 5-8. Northern Wisconsin State Fair in Chippewa Falls from July 11 to July 15; featured alumni Paul Coffman on July 11-12 and Lynn Dickey on July 13-15. EAA AirVenture in Oshkosh from July 23 to July 29; featured alumni Antonio Freeman on July 23-26 and Robert Brooks on July 27-29. Lambeau Field Live is free for all attendees at each statewide stop and will include activities for fans of all ages, meet-and-greets with Packers alumni, interactive Play 60 opportunities at select stops and Packers Pro Shop and Packers Hall of Fame satellite locations. The first day at most locations will feature a welcome from Packers President/CEO Mark Murphy, a history presentation from Packers historian Cliff Christl and a performance from Tundra Line. A schedule of the full programing at Lambeau Field Live each day is available at packers.com/100. A century in the making, 100 Seasons is the epic, 16-month celebration of the Packers’ rich history, which will be capped by the franchise’s 100th birthday on Aug. 11, 2019. A wide variety of events and activities will kick off over the next several months, with fans and community members invited to join in the numerous festivities. For more information, please visit packers.com/100.